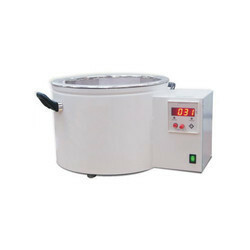 Our range of products include double walled round immersion oil bath and clear bottom round oil bath. Temperature Range 110 to 250 Degree C.
Double walled construction with efficient insulation system. Bath chamber of stainless steel. Stainless Steel immersion heater - peripheral shape to eliminate direct contact with flask - even if flask touches the bottom. 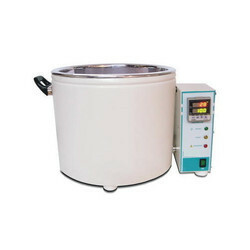 Round Baths - with Digital control are ideal for reactions, extractions, analysis and tests. A clear bottom. A uniquely designed Bath. Ensures no heater burn out due to lack of water. An absolute over-temperature alarm with auto cut off. Double walled, internal and external chamber full stainless steel construction. A floating overshoot alarm set 5°C above set point. Absolute over temperature alarm - audio - with auto cut off. End cycle visual indication with heater cut off. Round Baths are ideal for all applications requiring, reliable and safe reactions, extraction’s, analysis and tests. External Body oven baked epoxy finished. Insulated handles on sides for easy handling.